This interview was conducted in June of 1983 at Jack Kirk's workshop in Brooklyn, New York. An edited version of this appeared in Soundboard Magazine. The following is an unedited transcript of the tape made that day. Names are named and myths debunked. The guitars Mr. Kirk is currently producing are small guitars employing a short scale length. These instruments ere built in the style of Torres guitars and are indeed exceptional. Mr. Kirks guitars ere highly sought after by area recitalists and their owners will play no other instruments. Jack Kirk produces a small number of instruments per year, running a one-man operation. His instruments may be seen and purchased at Antonio Davids shop at the American Institute of the Guitar, 204 West 55th Street New York, N.Y. 10019. Q:How did you begin building guitars? A: Well, I became interested in building while I wee studying the guitar, ah, I thought it night be interesting to attend a few sessions with a local builder. I called a few people and tried to find out if there was someone in the area who built guitars who would let me go into his shop, you know, and sort of hit a brick wall on that. One fellow I met down in the Village, named Hahn (sp?) [said] Well, I havent got the time and this and that, he really didnt want to take on any apprentices. So, I had mentioned to Martha Nelson at the Guitar Society that I wanted to build and asked if she knew any schools for guitar builders. Oh yes, theres this place up in Vermont, at that time it was called Earth Works, run by Charles Fox. I called him end he sent me a. brochure. I went on a waiting list of about a year end I did go up there for a course of six weeks, and lived at his place. He took on six students at a time and you built a guitar in six weeks. Pretty fast! It was seven days a week, except Saturday afternoon. So, Ah, thats essentially how I learned the Basics. when I went up there, I didnt know a screwdriver from a chisel. My real interest in building didnt develop until then. My real love for it developed shortly after I came back. I realized that eventually what I wanted to do was build, even more than play. I studied classical guitar, you know, for twelve years. I studied with a number of people including Albert Valdez Blain for a while. So now I dont play all that much anymore but I keep my fingers limber playing the same old pieces over and over. Essentially, that is how I trained; I had been an apprentice to no one. Basically, Im self-taught, except for the basics taught at that school. He teaches the Spanish method of building up there, from the top down, then the neck, sides into the neck, its the Spanish method as opposed to the European method, which puts the top on last. Q: Which Luthers work has influenced you, either pro or con? A: Well, many have influenced me, but only recently have I really made any determination of who I really follow. Ah, well, thats a pretty big subject. Torres and Hauser are my idols in the guitar-making field and I like Romanillos; I like his approach. For a while Ramirez fascinated me, ah, I built a few Ramirezstyle guitars, big guitars with a long scale length, but Ive pretty much come full circle now and returned to basics. By that I mean, when its all said end done, I think the Torres and Hauser designs will be the optimum design of a classical guitar because I think big guitars are, as we say, out of focus when compared to smaller instruments. What youre really looking for is balance, clarity of tone and evenness of notes, I dont believe you can beat a smaller instrument. A large guitar has certain unique tone qualities, dark sound, very Spanish. Some pieces sound great on it. Q: In what ways do you feel your instruments differ from and/or improve upon the works of these luthiers who have influenced you? A: (Laughs) How they improve on it? Well, tone wise, I dont think I can improve on Hauser or Torres. I can only hope to equal what theyve done as far as tone. Ah, I think Ive tried to look for ways to improve bridge construction, things like that bridge. [A bridge he showed me employing two small dowels anchoring it to the face of the guitar.] I dont see any reason why a bridge should have to pop off. I use a method to fasten bridges where they wont pop off. There are those who will shout me down for approaches like that, you know, you must not leave an instrument in a way that cannot be repaired!, if you put a bridge on with hide glue, it can be removed with a hot knife. My idea is why not put everything on very solid so there will never be any need for repair? Q: Those dowels go through the bridge and into the top? A: They go under the tieblock decoration. They go through the bridge after the bridge has been glued to the face of the instrument. Then the tieblock decoration goes right on top of that, you understand, thats oh 3/32 of an inch thick and it covers these two little dowels there. The dowels go right through the top, you make the dowels just long enough so that when you put your hand in through the sound hole, you may feel them sticking out. After theyre on, you can take a piece of send paper and sand them flush with the top. I dont think those bridges are going anywhere! Theyre [the dowels] only 1/16 of an inch, just little pieces. In no way do they detract from the sound or anything. I use maple dowels cause thats whats available at [my supplier]. If I could get spruce dowels, Id use them. Q: Tell, me all about your construction techniques, bracings, etc. How far will you change your designs to accommodate any particular customers whims? A: Ill accommodate a customer. Ill do anything they want, within reason. If someone says: I want a red guitar, if they put a deposit on it, Ill make a red guitar! And then, when they come and say I dont like it, Im stuck with a red guitar! Most common thing is the deviation from the standard size guitar. I look at the Hauser and Torres as the standard size guitar although many people have gone bigger  the bouts are wider, searching for more volume, see? Thats a myth. It simply isnt true that a bigger guitar is louder, in fact, it can be weaker in volume. Modern day classical guitar strings only are capable of giving off just so much energy. Until they come up with a better string, theyre going to have to stick to a smaller instrument. There is so much experimenting going on, in guitar making. You see, there is no experimenting going on with violin making, changing design, theyre simply trying to find out how to match the plates. You have three factors there. Back and top and the air cavity inside. So youre trying to couple the top with the back and theyve learned how to do that with electronic instruments. Now, I have some electronic equipment whereby I can locate the resonating frequencies of the top end the back. I found out, after a little experimenting, that I could just about, ah, tell what that is by tap-tones, an yearsold way of just rapping and telling if youre close. The most important thing, I think, is to know if youre close, preferably within a semitone of one another. Ah, to know what note in particular a plate is tuned to, isnt all that critical. With guitars, youre sort of restricted by  I dont think a guitar plate will go any lower than say, ah, G, probably a G 196, any lower and the plates would be very, very thin. Lets say G up to a B as highest. So most guitar sound boards run from G to B. Backs are a semitone lower or higher then the tops. The point I started to make was, you know, many people are taking the scientific approach now to guitar making  electronic equipment. Have you heard of Fred Dickens? Hes a friend of mine. A few years ego, during my playing career, I owned one of his instruments. So we became friends after I began building. Ah, I went over there and found out that he had given up building and the only guitars he would build were those in connection with his research. 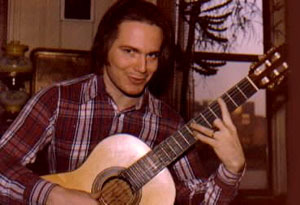 The work he does now, this guitar research work, is done for the Acoustical society. They have some very technical studies going on. Fred writes for them about guitar acoustics. So, what I wee going to say was that I was fascinated by this scientific approach to guitar building and I went out there. He has a chart recorder in his shop plus essentially the same equipment I have here  a function generator with a counter, an automobile speaker and a mono amplifier. You take a little terrarium send, put it on the plate and vibrate it. When you reach certain resonating frequencies, the sand begins to dance on the surface and forms patterns. These patterns are very telling as to what youre looking at, and there are many modes these patterns travel through, end if youve ever heard someone say the ring mode, the ring mode on a plate is celled mode five and that would indicate that the plate is in tune with itself. What Ive just done is take a big subject and condense a few facts. In violin making, when they tune plate e1ectronica1ly, they keep carving and shaping until they get this ring mode, and that plate is then considered to be in tune, and it will give all it could possibly give. Thats the most you can get out of a plate. Q: You do that with guitar tops then? A: Its very difficult with guitar tops. Fred was researching for a ring mode  it took him over a year to get his first ring mode. He went through all the modern bracing systems, Ramirez especially, Bouchet, with the arched brace under the bridge, end Ill tell you exactly where be found his one ring mode after one year on a Torres pattern  seven symmetrical fans with a vee. He didnt come close to it anywhere else. So, ah, then he was doing experiments with the depth of the guitar and, ah, to find out how the air resonance is affected by making the guitar shallower or deeper. Learned all kinds of interesting things to write about, but hes really not found any way to build it into en instrument. I still havent seen a socalled great guitar that was built using electronic tuning. You know what I mean? I think science is telling us why things sound like they do, but whether theyll be able to build a greet guitar, I dont know. I always tell that to everybody. I believe that the worlds great guitars will continue to be built by the empirical method, by people building to a pattern, by experience. I havent seen anything different on the horizon. This group, this Cat Gut Acoustical Society is made up of a bunch of physics engineers, scholars, teachers, ah, very knowledgeable people. Acoustical experts, and their main purpose was to study the violin, violin acoustics, to find out how to duplicate a Stradivarius  and theyre doing good work. They still cant duplicate it though. And they claim to be building great instruments, but you never hear about them. Just like how-to books, There are just a few books on guitar making, and youve noticed the people building the great guitars dont write the books about it. You have Sloan, Ive never seen a Sloan guitar, have you? So Id say the more you build and the more you study the art, the more you talk to people, you find out that theres all kinds of hokum floating around about whats good, bad, and what works and most people dont really know the difference...ah, there are so many old wives, tales. A: I consider the Torres bracing system...ah, lets put it this way I think that if a person were going to use no other bracing system, was looking for just one system to use and said give me one, Id give, them seven symmetrical fans with a vee. Now the vee, I dont think you really need it. All the vee does is simply supply the lower bout with some extra stiffness. Seven symmetrical fans seems to Le a good system that, if you dont stray too far from that, ah, it will work. Youll come out with a good sounding guitar...providing everything else went along with it, which is saying a bell of a lot! Theres no mystery about guitar bracing, nothing mystic. All braces do is provide stiffness in certain areas. You could carve, if it were practical, a guitar soundboard without braces. All youd be doing is removing mass and adding stiffness. The two best guitars that Ive ever made have been small instruments, plain and simple Torres bracing. Kathys and Montys (Kathy Szedenik and Louis Monty Jones, two area musicians with Kirk~ guitars) are both essentially the same bracing system. Montys is a little deeper. Q: You dont use any exotic materials, do you? A: Ah...well, I built four redwood-topped guitars. Theyre standard string length, but the bodies are Ramirez size. Albert Blain told me he liked the shape of this Aria guitar he has so I said~ Alright, let me trace it. So I brought the Aria out here and traced it. I made those four guitars (to that shape). It is a rather pretty shape, except I thought they were too big and I told Al about this. I also said Al, theres nothing new about redwood, in fact redwood gets bigger marks as a tone wood than spruce or cedar. You must learn how to work with it, though. These redwood guitars came out sounding pretty good, especially Leo Riveras. There is the mate, over there [points to guitar in room] and the other two I took up to Tony David [Antonio David, 204 W. 55th St.] cause he wanted two guitars. Redwood will be accepted as cedar was. As Ramirez made cedar famous, someone will make redwood famous. Basically though, Ive settled down to spruce end the Torres/Hauser thats the name of my game from now on. Theres no other way to go for me. I think one of the finest guitars around today is one that Julian Bream has  that little Romanillos guitar hes got. If youve heard him play it in a big place, it sounds like hes playing on an amplifier! Thats what you can get out of a small instrument. Essentially Im working towards possible, evenness of notes, and above all, playability. A guitar that sounds great is not worth a damn if its unplayable  and there are many of those around! I dont, you know, try to kid myself about this art. This is always bigger than I am. All I hope for is just to make as many good guitars as I can. Its very difficult. It keeps me humble!